There is much to say about this book. Book six of the Wheel of Time series is by far the least action-packed of all the preceding books. Instead of action, Jordan decided to make this book more about political intrigue. For some, this means the book might be considered “slow” or “boring,” but not to me. In fact, I found all the intrigue exciting and interesting. One of the things that stood out to me while reading this book was the way Jordan’s writing style evolved throughout the series. By book number six, Jordan had settled on a rather cinematic writing style, by which I mean that many of the scenes he wrote evoke scenes in a movie, and serve much the same purpose. It’s a pleasant way to tell a story, and an especially nice way to build characters and settings. I appreciated that in the book. 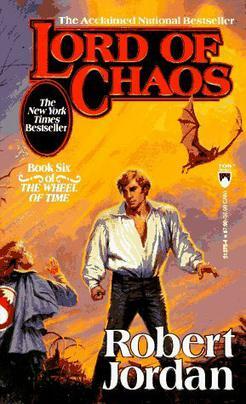 My criticism of “Lord of Chaos” is that this book is perhaps the least complete of the series so far. Despite its over-one-thousand pages, the book manages to simply advance the Wheel of Time series. It does not tell a stand-alone story. The book could not be read by a newcomer; the reader absolutely must have read the preceding books to understand this one. And that same reader will have to wait to the next book to have any aspects of the plot resolved. I understand that writers of series must give the reader incentives to read the whole series, but if a writer can’t tell a “complete tale” in one thousand pages, then this starts to speak to the quality of the writing itself. Like the previous installment, “Lord of Chaos” suffers from a bad title. There is no Lord of Chaos in the book. I don’t even know who “lord of chaos” is supposed to refer to. One might think that the events in the book are a sort of “chaos,” I suppose, but not really. It really seems to be a title pulled out of thin air, only because it fits the ambiance of the story. It certainly refers to nothing within the book itself. Despite its shortcomings, though, it’s a good book. I enjoyed the intrigue, and I’m looking forward to the next book in the series.